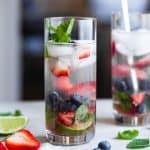 This coconut blueberry mojito recipes with strawberries is a healthier, gluten free, easy Summer drink with only 130 calories! Perfect for July 4th! Divide the lime slices and mint leaves between 2 highball glasses and use a muddler to muddle them together until the limes have released their juices and the mint is broken down. Divide the monkfruit (I like 2 tsp per mojito, but you can start with less if you like) between the 2 glasses, as well as the blueberries and strawberries. Muddle again until the fruit is mostly broken down, but still has a few chunks. Divide the rum and the coconut water between the 2 glasses and fill up with ice.